Early August 2017 marked the end of a 10-week, record-long intense brown tide on Long Island. A year later, “since nutrient loads haven’t changed, we expect more of the same,” said SBU’s Chris Gobler. Credit: Dr. Christopher Gobler. Stony Brook, NY, February 21, 2019 - In 2018-19, New York Sea Grant (NYSG) supported more than $1.1 million in university-based research related to a variety of marine, Hudson estuary, and Great Lakes topics and issues, including coastal flood risk, harmful algal blooms, sea grass restoration, invasive species and seafood safety. NYSG research also sets benchmarks within the scientific community, advancing the state of knowledge in many fields. Researchers at Stony Brook University (SBU) are trying to better understand how nutrients in sediment are connected to harmful algal blooms (HABs). 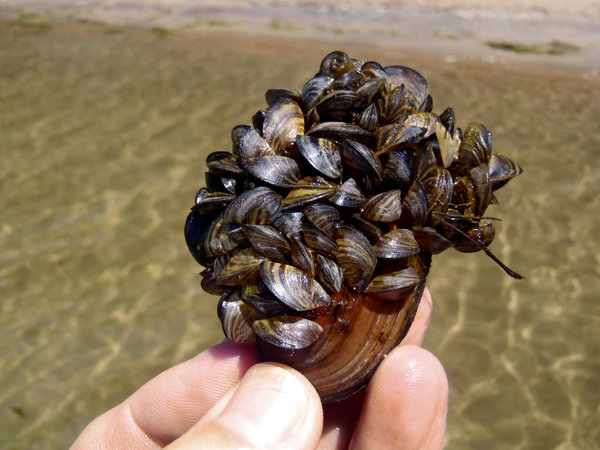 HABs degrade water quality, and can lead to hypoxia (oxygen-depleted waters), acidification (a process by which absorption of carbon dioxide gas produces a pH imbalance in these waters, making them more acidic), fish kills, and decline in valuable bivalve species (oysters, clams, mussels and scallops). A SBU-led team is assessing the ability of seagrass to draw down carbon dioxide from the aquatic environment. This could reduce the effects of ocean acidification, which would be a benefit to shellfish. Credit: Kaitlyn O’Toole. 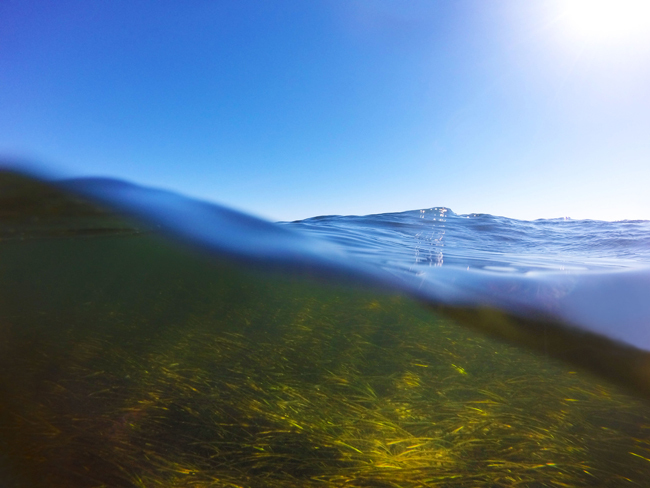 A SBU-led team is exploring connections between ocean acidified waters and seagrasses, the latter of which could provide refugia — areas of more favorable conditions for calcified organisms such as corals and crustaceans — from the surrounding acidified waters. It could also mean lower carbon dioxide levels, which would benefit shellfish in seagrass beds. Cornell University investigators are developing an inexpensive environmental DNA-testing method for the earlier detection of AIS and co-detection of multiple species to assist coastal resource managers at less cost than current detection methods. Field testing will take place on Lake Erie and Lake Ontario. 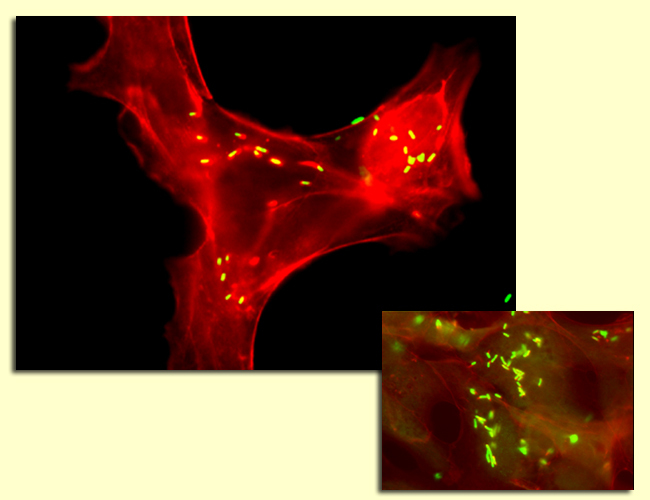 Photomicrograph inside an animal cell infected with Listeria monocytogenes (yellow and green). Foods implicated in outbreaks and sporadic cases almost always are refrigerated products that can support the growth of this organism, as it can exist under conditions that usually inhibit the growth of other pathogens such as temperatures as low as 34 degrees F. Credit: Martin Wiedmann, Cornell University. Food science researchers at Cornell University are developing techniques for processors to fine tune their control strategies of Listeria monocytogenes (LM) for cold smoked salmon by assessing the effects of seafood-relevant conditions on efficiency of Nisin, an antibacterial compound. This project will provide information applicable to smoked seafood processors in NYS, allowing them to improve existing and develop new LM control strategies. 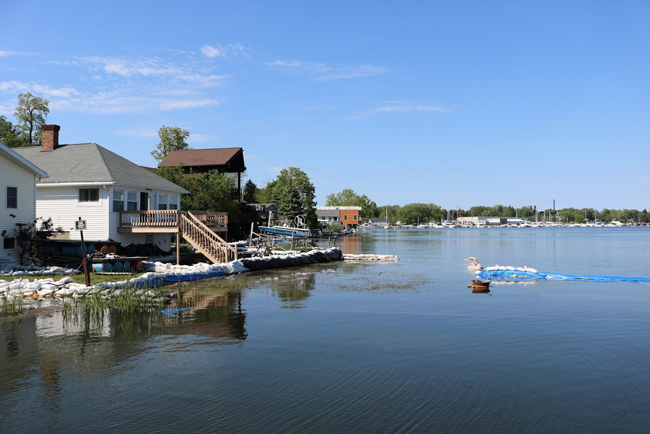 Lake Ontario communities were inundated with high water in 2017. Credit: Mary Austerman/NYSG. In 2017, NYSG responded to Lake Ontario stakeholder requests for a standardized means of reporting waterfront property damages due to unprecedented high water levels by supporting investigators at Cornell University who, in their first study, developed and conducted an online survey. 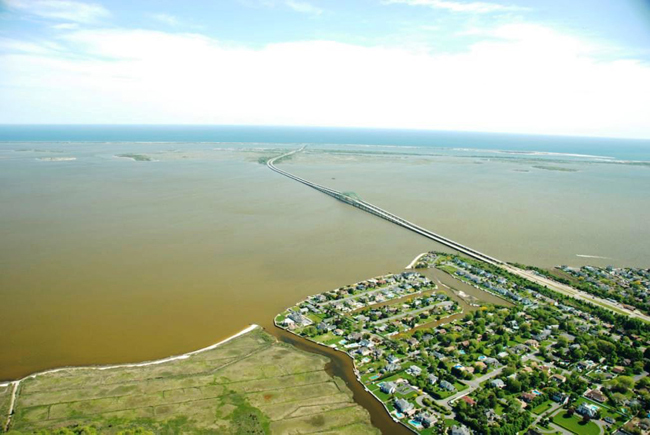 The goals were: (1) document the parcel-level impacts of the event on waterfront properties, (2) provide municipalities with information to assist community-based planning to reduce flood risks and (3) verify existing flood risk modeling. For this 2018-20 project, survey data is fueling a Flood tool being developed that (1) incorporates the ability to explore flood risk under a range of future scenarios and (2) will be designed using stakeholder feedback to maximize its utility for local planning.